Poverty is constantly on the rise in all South Asian countries; so is the rise of religious fundamentalism, and there is a close link between the two. Australia recently hosted Indian Prime Minister Narendra Modi as part of the G20 summit. The reported pop star reception he received from the Australian-Indian community illustrates the current popularity of conservative politics and religious fundamentalism in South Asia. 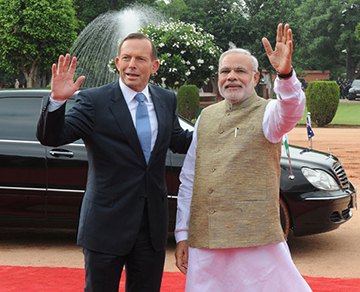 Narendra Modi with Australian Prime Minister Tony Abbott. The enthusiasm for Modi, however, overlooks his responsibility for the mass murder of 1000 Muslims in Ahmadabad during 2002. It also ignores how the communal violence orchestrated by his Bharatiya Janata Party (BJP) in last May’s general elections in India helped ensure his landslide win. Pakistan, too, is no stranger to fundamentalist violence. The murder of a Christian couple on November 10 near Lahore is the latest manifestation of this growing fanaticism. They were falsely accused of burning the Quran, the Holy Book of Islam. Incited by a local cleric, over 1000 Muslim villagers mobbed the brick kiln where the couple worked and threw them into the oven. The right-wing fundamentalist trend has mainly arisen because progressive and democratic parties in government, working within a neoliberal framework, have failed to resolve the basic issues confronting the overwhelming majority of people in the country. Where civilian governments are weak, people are likely to see fundamentalism as viable. Religious fundamentalists in Pakistan manipulate religious belief, especially as there is no state control over their activities. Banned terrorist networks can change their names slightly and continue to operate publicly. The fundamentalists use religion to stir up hatred and silence dissent. They assassinate radical journalists and human rights activists and are starting to target other supporters of religious tolerance. These are difficult and dangerous times for the left, for social democrats, radical liberals, trade unions and peasants, women, minority rights and youth organizations in Pakistan. The spread of neo-fascist ideas is leading those belonging to Christian and Hindu communities (who make up three percent of Pakistan’s 200 million people), as well as members of minority communities such as Hazaras, Shias, and Ahmadis, to leave Pakistan. Women and other marginalized sections of society are also on the radar of fanatical groups. Malala Yousafzai, the internationally recognized activist and Nobel prize winner from Swat, for example, has been attacked because of her courageous writings and efforts to promote girls’ education. 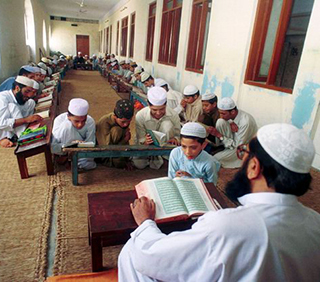 Students at a madrasa in Pakistan. Most of the terrorist activities carried out in Pakistan are linked to religious schools known as madrasas. Some of the madrasas model themselves on the Taliban and have become sources of wealth for leaders of Islamist parties and extremist groups. The 20,000 or more madrasas in Pakistan have become popular sources of education because of the poor state of public schools. (The government spends only two percent of its budget on education). It has been suggested in vain that the major madrasas could be placed under state control and their funds audited. Actually, if the federal budget were increased to 10 percent of GDP and fees were abolished, then all citizens would have the opportunity to attend school, college, or university. Pakistan must deal with terrorist activities according to the law, and state institutions must break all links with fundamentalist groups. Fanatics must not be allowed to exercise control over any area. Tackling poverty is the ultimate answer to neutralizing the appeal of extremist groups and fundamentalists. Increasing the basic wage, introducing an unemployment allowance, and implementing massive land reforms to distribute land to the landless would undermine the economic and ideological power of extremism. There are no easy solutions to defeating terrorism and its barbaric neo-fascism–but rule of law, education, and an end to poverty would be a good start. Farooq Tariq is general secretary of the Awami Workers Party, founded in Pakistan in 2012. The Awami Workers Party condemns the senseless and merciless slaughter of innocent school-children in the attack by militant jihadists in Peshawar. The AWP expresses its sincere condolences to the parents and family of the innocents killed in this act of inhuman brutality, fueled by the genocidal, millenarian ideology of militant Islamism. The AWP restates its stance that the Pakistani state and military’s decades-long support of jihad as an instrument of policy (including the failed policy of strategic depth) is directly responsible for the brutal menace of Islamist terrorism that is engulfing this country today. Apart from creating and supporting jihadist groups, for decades, the state and military (with the financial and political assistance of imperial powers) has indoctrinated millions with conservative Islamist ideologies for the purposes of keeping safeguarding its strategic interests, leading to the fascist violence killing innocent people in the country today. Further, the AWP also holds complicit in this slaughter those political parties who maintain links with these groups for their narrow political interests and subscribe to the same millenarian ideology of the fascist jihadists. The AWP strongly believes that until the state completely abandons the ‘national security state’ paradigm and its support for jihadist groups as ‘strategic assets’ outright without discrimination and ceases the use of religion in matters of the state, this violence will not end. The Awami Workers Party calls on all political forces in Pakistan to recognize the clear dangers of the Islamist fascism that is consuming this country and unite to eliminate state support for all forms of terrorism and end the abuse of religion as an instrument of state policy in Pakistan.